Initially commissioned in 1997, Interstate 540 is a commuter freeway serving northern Wake County and the Raleigh metropolitan area from Raleigh-Durham International Airport (RDU) east to Knightdale. The freeway forms the northern third of a planned beltway encircling the capital city west to Apex, south to Garner, east to Knightdale and north by Wake Forest. The Interstate portion of the route is free, while the remaining sections open or planned are designated as toll roads and numbered as North Carolina 540. The western portion of the loop presently extends south from I-40 and Research Triangle Park to NC 55 outside Holly Springs. The northernmost mile, between I-40 and NC 54 (Exit 69), is designated as NC 540, while the 15 mile route leading south to NC 55 is designated as Toll NC 540. End shields are posted at the transition between the two state route classes. Toll NC 540 south from Toll NC 147 (Exit 67) is included in the 18.8 mile long Triangle Expressway (TriEx for short). The remainder of the route, known as the Triangle Expressway Southeast Extension, is unbuilt at this time. Split into three sections, the $2.2 billion project is currently under environmental study, with the Final EIS approval expected by mid-2017 and construction envisioned for Fiscal Year 2017-18. Phase 1 – NC 55 by Holly Springs to U.S. 401 near Wake Technical Community College – $405.4 million. Design-build contract awarded in fiscal 2017-18. 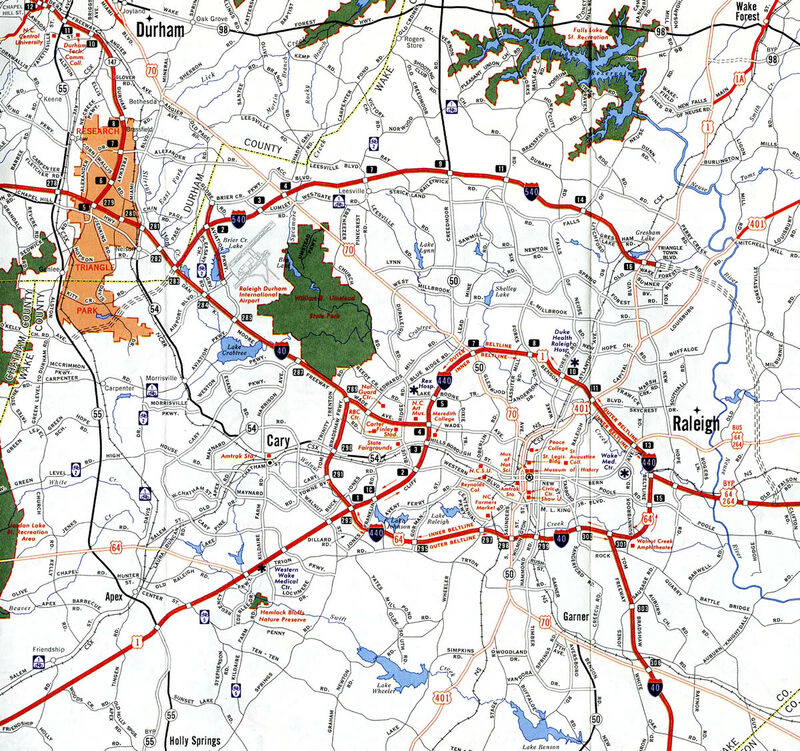 Phase 2 – U.S. 401 to I-40 near Garner – $565.1 million. Design-build contract awarded in fiscal 2023-24. 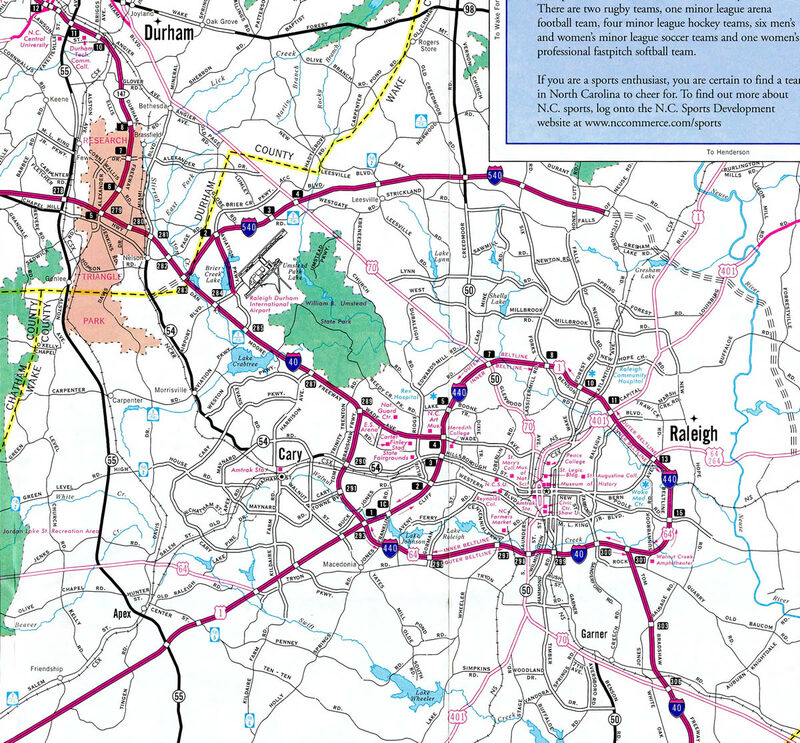 Phase 3 – I-40 to I-495 & U.S. 64-264 (Future I-87) at Knightdale – $520.7 million. Not scheduled through 2025. Longtime residents of Wake County refer to Interstate 540 by its number quite often, as opposed to I-440, which is nearly exclusively referred to as the Beltline. I-540 is also referenced as the “Outer Loop” or interchangeably with I-540 as the “540 Outer Loop”. 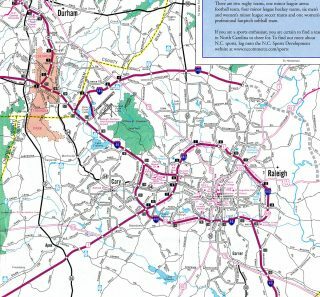 Planning for what would later be Interstate 540 formally began in the early 1970s, after the idea emerged in 1968.2 This need for a new route followed a series of developments, starting with the dedication of Research Triangle Park (RTP) in 1959 and the 1962 opening of IBM within the park. Succeeding development in North Raleigh followed, with the Brentwood, North Ridge and Quail Hollow subdivisions established. The lone freeway in Raleigh at the time was the Beltline, while I-40 was not completed until 1969. North Carolina 54, with just two lanes then, was the only way into RTP otherwise. Once Interstate 40 was completed, the need for an east-west freeway through North Raleigh became apparent. Traffic between RTP and Raleigh had to navigate north-south roads to reach the Beltline and its connection with Interstate 40 west into RTP. A direct connection from I-40 to near RTP from north Raleigh was prevented due to the presence of Umstead State Park and the RDU Airport. The addition of many new neighborhoods to the southeast of Umstead Park hampered the potential of a southern route, though one corridor, the Duraleigh Connector, was eventually chosen. It however was canceled, leading efforts to shift to a new northern route further out from existing development. Named the Northern Wake Expressway, the new northern corridor appeared on planning maps in 1976 as a route along the edge of the Falls Lake watershed. Developers began acquiring land in anticipation of the future route, with subdivisions taking shape along the eventual Interstate 540 by 1985. The right of way was preserved however, so very few structures were demolished to make way for the new freeway. Population growth in western Wake County gained steam by the mid 1980s, leading NCDOT to expand the northern corridor into a beltway encircling Raleigh, at a roughly 12-mile radius to Downtown. These changes did not effect preliminary work on the original Northern Wake Expressway, as it was incorporated as the first segment of planned full loop. The Beltline freeway circling Raleigh was designated as Interstate 440 in 1991, while the Northern Wake Expressway remained undesignated until 1996, when the first portion neared completion. NCDOT announced then that the route was assigned the temporary designation of Interstate 540, and upon full completion of the beltway, would be renumbered as Interstate 640. This was based upon the long-established convention for the numbering of even three-digit Interstates as loops or bypasses. The first section of Interstate 540, connecting Interstate 40 (Exit 283) within the Durham city and county limits with U.S. 70 (Glenwood Avenue) in northwest Raleigh at Lee township, opened on January 21, 1997. The opening resulted in immediate changes to commuting patterns between RTP and Raleigh, with U.S. 70 and I-540 providing a viable alternate to the Beltline and I-40. Increasing congestion over a three year period along Glenwood Avenue however resulted in some commuters shifting back to the old I-440 and 40 route. NCDOT announced in 2002 that Interstate 540 would no longer be renumbered as I-640 upon completion of the route southeast back to Interstate 40. This would give the Northern Wake Expressway the distinction of being the first bypass Interstate route in the system to utilize an odd number. The completion of Interstate 520 in 2009 as a full loop around Augusta, Georgia and North Augusta, South Carolina added a second route matching this criteria. Aviation Parkway was constructed north from I-540 to Globe Road as part of the 7.5 mile section of the Outer Loop in 1999. The corridor for Interstate 540 otherwise consisted of undeveloped forest land at the time. Construction for Interstate 540 east from NC 50 to Falls of Neuse Road bisected the Shannon Woods subdivision while otherwise threading between established neighborhoods. The 3.3 mile section of I-540 opened in August 2002 included eastbound access to Triangle Town Boulevard. The north-south arterial was built to service Triangle Town Center, an enclosed shopping mall opening around the same time as the freeway. Further extension of Interstate 540 east began with construction commencing on September 8, 2003.6 A ribbon cutting ceremony held on January 16, 2007 preceded the formal opening of the 540 Outer Loop from Capital Boulevard (Exit 16) southeast to U.S. 64 & 264 (Exit 26) at Knightdale.7 NCDOT resubmitted the 9.5 mile link to Knightdale for Interstate status to AASHTO on November 5, 2008. FHWA then granted final approval for the designation on December 22, 2008, expanding I-540 to 26 miles in length. Further changes took place at the east end, with the U.S. 64 & 264 bypass around Knightdale redesignated as Interstate 495, a route slated to connect the Beltline in Raleigh with I-95 outside Rocky Mount. 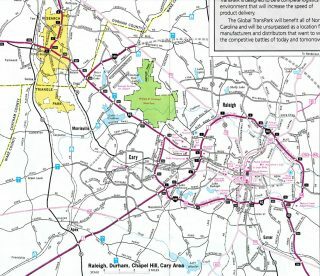 NCDOT officially codified their plans to maintain the I-540 designation as part of the request for I-495, despite I-540 now ending at Interstates at both ends. I-495 was subsequently redesignated as Interstate 87, following AASHTO approval of the new route for U.S. 64 between Raleigh and Williamston. The North Carolina General Assembly approved the creation of the North Carolina Turnpike Authority in 2005. The organization was charged with studying potential corridors for the state’s first modern toll roads and coordinating construction efforts to build them. One of the first projects considered was the Western Wake Expressway, the long planned western component of the I-540 loop around Raleigh. The authority initially sought the authorization for tolls on a loop paralleling NC 55 to the west around Apex and Cary. These efforts took place while construction was underway along a four-mile extension of I-540 from I-40 to NC 55. 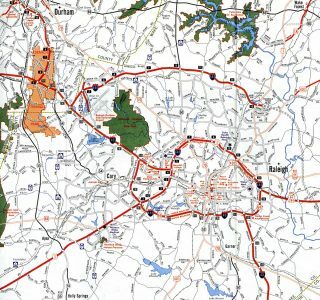 The Turnpike Authority reversed course with plans for the Western Wake Expressway, instead opting to toll the entire stretch of the 540 Outer Loop south of Interstate 40. Their rational was that the authority also had jurisdiction over the tolled extension of the Durham Freeway (NC 147) under development from I-40 south through RTP to Davis Drive. Had the Authority not requested this change, the new Toll NC 147 would have ended at the toll free section of I-540 being built west to NC 55. The change resulted in a continuous tolled highway. Federal law prohibits spending of federal money on any tolled Interstate. I-540 was planned as a full Interstate and slated to receive 90% federal funding. However the advent of the tolled Western Wake Expressway changed the funding mechanism for the remainder of the route. As such, the Federal Highway Administration did not permit NCDOT to designate the new roadway as an Interstate. NCDOT complied and renumbered the initial four-mile stretch of I-540 leading southwest of I-40 as part of NC 540, with the tolling prefix applied west of NC 54. This was done to provide continuity with Interstate 540, despite its violation of an internal department rule against using the same number for different types of highways within the state system. Actions to number the new toll road as North Carolina 540 took place only two weeks before the road was set to open, leading DOT crews to make quick changes on signage posted already with I-540 markers. Additional changes were needed in that the mile markers and exit numbers for NC 540 were found to be 19 miles too low because of a measurement error by the DOT GIS mapping unit for the intended full loop. U.S. 64 & 264 wind across the Neuse River on the one mile approach to Exit 422 with Hodge Road. The first guide sign for I-540 appears here with the control cities of Wake Forest via U.S. 1 north and Raleigh-Durham International Airport (RDU) via I-540 west. Photo taken 05/30/07. U.S. 64 & 264 leave an area of wetlands east of the Neuse River and enter a folded diamond interchange (Exit 422) with Hodge Road. A high speed directional ramp follows in 0.75 miles for Interstate 540 west across the north Raleigh suburbs. Photo taken 05/30/07. Exit 423 departs U.S. 64 & 264 east for Interstate 540 leading northwest toward Wake Forest. U.S. 64 advances east as the future I-87 to Interstate 95 near Rocky Mount, while U.S. 264 meets I-95 and I-795 near Wilson. Photo taken 05/30/07. Approaching the future left-hand turn for Interstate 540 east to Louisburg and Knightdale on U.S. 1 south. The 540 Outer Loop opened southeast from here on January 16, 2007. Photo taken 07/12/05. U.S. 1 north saw back to back lane drops beyond the future ramp for Interstate 540 east to U.S. 64, U.S. 401 and Louisburg. Photo taken 07/12/05. Two lanes depart from Interstate 540 west for Aviation Parkway (SR 1002) south to the passenger terminal of RDU Airport and north to Globe Road as the Outer Loop turns southwest to Interstate 40. Photo taken 07/12/05. Prior to July 14, 2007, all traffic along the westernmost extent of Interstate 540 defaulted to the collector distributor roadway (Exit 1) for I-40. Photo taken 07/12/05. Work on the Western Wake Expressway portion of I-540 was underway by February 2004. The road eventually opened as NC 540 to RTP and NC 55 at Apex. Prior to that, motorists werer directed onto Exit 1 for I-40 northwest to Durham and southeast back to Raleigh. Photo taken 07/12/05. Exit 1B for Interstate 40 was expanded to a two-lane off-ramp by 2011. Both overheads here were replaced then. Photo taken 07/12/05. A cloverstack interchange joins Interstates 40 and 540 with North Carolina 540. Photo taken 07/12/05. See Interstate 40 Eastbound – Orange & Durham Counties @ AARoads for photos covering the exchange with I-540 east and NC 540 west. A temporary overhead posted one mile ahead of the off-ramp (Exit 283B) with Interstate 540 east on I-40 west. A new sign bridge here displays Raleigh and connections with U.S. 1 and 64 in addition to U.S. 70 now for Exit 283B. Photo taken by Chris Patriarca (06/13/03). A lane drop occurred previously at Exit 283B for I-540 east. A fourth through lane was added here for I-40 west by September 2003. Original guide signs for I-540 used no control points and instead simply referenced the connection with U.S. 70 (Greenwood Avenue). Photo taken by Chris Patriarca (06/13/03). This sign bridge was erected in anticipation for the Western Wake Expressway leading I-540 south to Cary and Apex. It later hosted an overhead for NC 540, but was replaced by 2012 when the TriEx extension opened south to U.S. 64. Photo taken by Chris Patriarca (06/13/03). Construction continued for the eventual bridges carrying the I-540 / NC 540 mainline across Interstate 40 through 2004. A loop ramp (Exit 283A) opened here in 2007 for NC 540 west to NC 55. Photo taken by Chris Patriarca (06/13/03). Much of the research on this guide was the work of Brian LeBlanc and published on the former Wake County Roads web site. The information reproduced here was done so with his permission. “540 Outer Loop for southern Wake – To finish 540, DOT must plan to protect mussel – Federal biologists will decide whether highway would jeopardize species’s survival – NCDOT will consider expensive measures to minimize injury to dwarf wedgemussel – One possibility: an elaborate program to propagate mussels in captivity.” News & Observer, May 9, 2016. “I-540 link to shift traffic.” News & Observer, June 26, 2001. “Newest section of I-540 soon to offer rush-hour relief.” News & Observer, December 11, 1999. “Segment links Loop to Creedmoor Road.” News & Observer, December 22, 2000. “New leg of Outer Loop opens; loop signs soon to say east-west.” News & Observer, August 13, 2002. “DOT To Start Working On New Section of I-540.” WRAL.com – Traffic, September 5, 2003. “I-540 link opens today.” News & Observer, January 16, 2007. “I-40 east lane opens.” News and Observer, September 2, 2003. “Relief Comes Saturday for RTP Commuters.& WRAL TV, July 13, 2007. “New 540 section opens today – Toll collection starts early Thursday for the 540 Loop south from RTP to Apex.” News & Observer, August 1, 2012. “Drivers get a new route to RTP – 6-mile TriEx section opens today, completing Holly Springs-to-RTP link.” News & Observer, December 20, 2012. Page updated August 18, 2016.